Morocco Leather&Shoes – 4th Morocco International Leather&Shoes Fair which was held between 28 – 31 March 2018 at OFEC, La Foire Internationale de Casablanca. Worldwide visitors discovered the potential of Morocco market through Morocco Leather & Shoes fair. Morocco Leather & Shoes Fair offers to its exhibitors remarkable export volume by introducing the new buyers, agents, distributors, partners for the whole Morocco, Mediterranean and Africa market. The unique platform for Leather, Footwear, Bag sector provides the perfect business platform for its international exhibitors. With an exciting and a big number of buyers Morocco Leather & Shoes Sub-Industry Fair offers is the most prestigious sector meeting in the region. Morocco Leather & Shoes Fair gathers more than 10.000 sector visitors at one roof by setting latest season leather, shoes and bag trends. This prestigious fair is organizing by Pyramids Group and with the partnership of FEDIC and Atelier Vita. 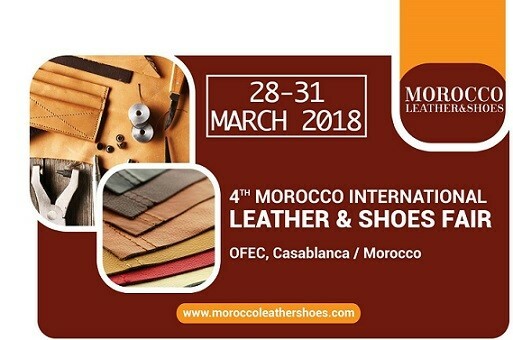 With the remarkable success of the last edition Morocco Leather & Shoes Fair 2018 will bring together around 200 exhibitors from 7 countries: Morocco, Turkey, India, China, Czech Republic and Egypt; also it is expected to have 11,000 trade visitors from Morocco and 25 foreign countries from West Africa, North Africa, the Middle East, the Gulf and Europe. Morocco Leather & Shoes Fair is full of opportunities for exhibitors and visitors to do business on a global scale. Morocco Leather & Shoes Fair is an international platform where sector professionals are able to meet each other and develop their network. The opening ceremony held on Friday, 28 March at 16:00 at the Casablanca International Fair in the presence of several national and international personalities, export councils and federations. Ambassadors of pavilion countries will give honor to our events.